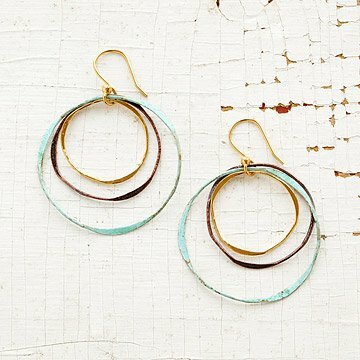 A trio of brass, gold plating, and rich patina lends these earrings a touch of rustic Latin American flair. Argentinian jewelry designer Fernanda Sibilia brings the flair of traditional Latin American handicraft to her rustic, hand-hammered metal pieces. To make these warm, mixed-metals earrings, she deftly shapes brass threads into delicate rings of varying thickness and then electroplates select pieces with lustrous gold and warm copper. She then lets the magic of oxidation give select rings a one-of-a-kind patina that varies in hue from dark umber to creamy sea green. Handcrafted in Buenos Aires, Argentina. Discover more mixed-metals jewelry in Fernanda's collection. Make it a set! Pair these earrings with the Cerro Statement Necklace and Swirling Circles Cuff. Excessive light, heat or moisture will deteriorate the quality of the plating on the metal. The metal may darken or tarnish with normal wear. After each use, gently wipe with a soft cloth and store in a jewelry box or in a fabric pouch. Do not wipe the metal surface with a polishing cloth because excessive polishing may rub off the plating and is not recommended. I wanted a fun, everyday earring and these are perfect. They are unique in their design but they still go with everything. Very lightweight so you don't even know you're wearing them. Perfect length too. I have work them several times in the last week- very versatile. These are my favorite at the moment. Every time I wear them I get compliments and they go with everything! These earrings are unique, fun, and funky. I've gotten compliments every time I've worn them. Couldn't be happier with my purchase! I he received many compliments every time I wear these earrings. These were beautiful. I loved the metal and the uniqueness. I am always on the lookout for those items that can't be bought just anywhere. The price was great. They arrived in perfect condition and in a timely manner. And my daughter was so surprised and excited, loved them beyond words.